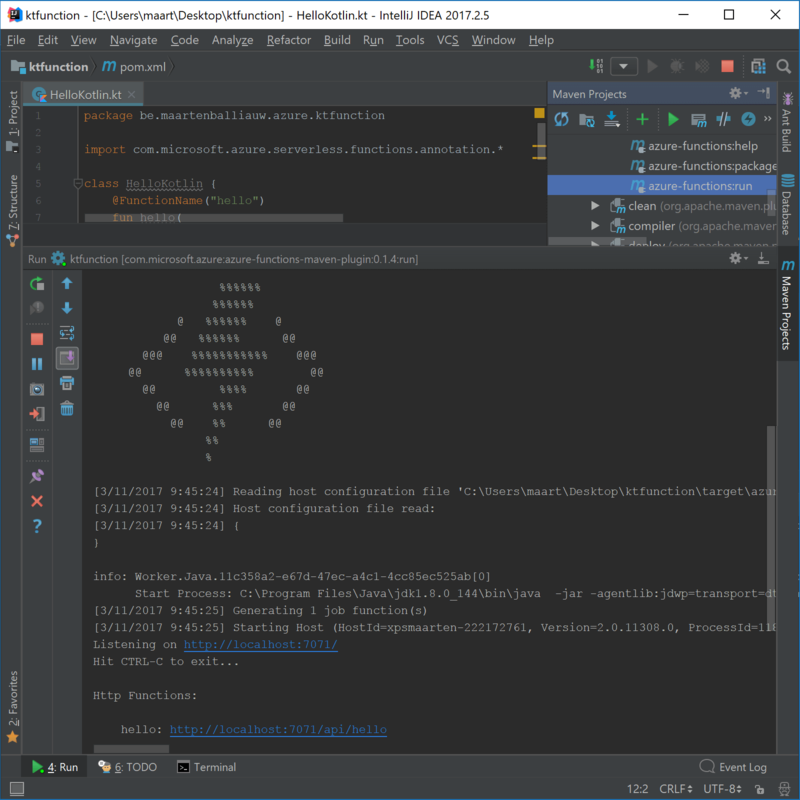 Azure Functions supports Java! But does it support other JVM languages? Let's see what it takes to get serverless Kotlin functions running on Microsoft's cloud. A while back, the Azure folks announced support for Java on Azure Functions. My immediate thought was: “Do they mean Java or JVM? And if they mean JVM, will it work with Kotlin?” In this blog post, we’ll find out! Azure Functions are Microsoft Azure’s event-driven, serverless compute experience. That’s all the buzzwords, probably, but it boils down to not having to worry about virtual machines, sites, etc. The idea is we can just write a function, then give options for Azure to run it. It could be whenever an HTTP request comes in, a file is uploaded to a storage account, or when there is a full moon. Azure will execute it, no matter if it’s just once or 500,000 times. Why Try Azure Functions With Kotlin? Over the past year, I was introduced to Kotlin at JetBrains. Some of our internal tools run it, IDEs like Rider are built using it, and I’ve been writing some plugins for our .NET IDE as well. One to run XDT transforms, one to manage .NET Core SDK versions, and one that will provide C# Interactive support (it won’t live as a plugin but will be in the product out of the box). To me, the language is easy to get started with coming from C#. In fact, it feels like it combined the best things from C# with some F#, Swing, TypeScript, etc. — in short: It’s enjoyable! Kotlin compiles to the JVM and provides Java interop. What I find very neat is that it provides a C# LINQ-like syntax but compiles it to good-old-and-fast low-level language constructs like for loops. In short: I’m starting to really, really like this language! Also loving Azure as a cloud platform, I felt like I had to marry these two. Turns out that marriage is quite easy if you know how to do it — which I did not but learned along the way. Here goes! 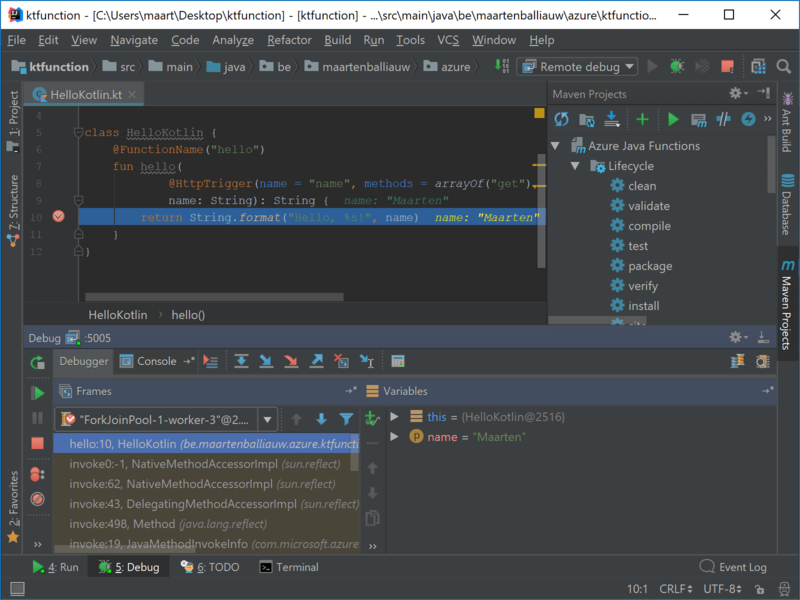 In this blog post, I will use IntelliJ IDEA as the IDE. In addition, we’ll need JDK version 1.8 installed (and the JAVA_HOME environment variable set). Next, we’ll have to specify a group id and artifact name (compared to .NET, these two are our NuGet package identifier — everything in Maven is a package so our project will be, too). 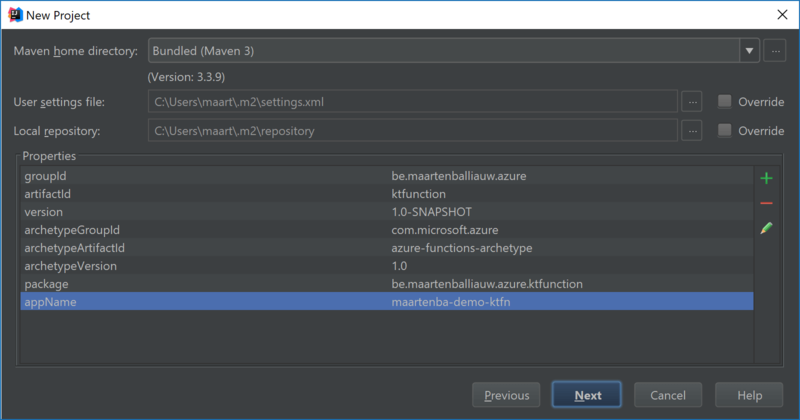 I’ll go with the Java-style group be.maartenballiauw.azure, then ktfunction as the artifact name. Next, we must add two additional properties: package and appName. These will be used later on by the Azure Functions Maven plugin to deploy our app. 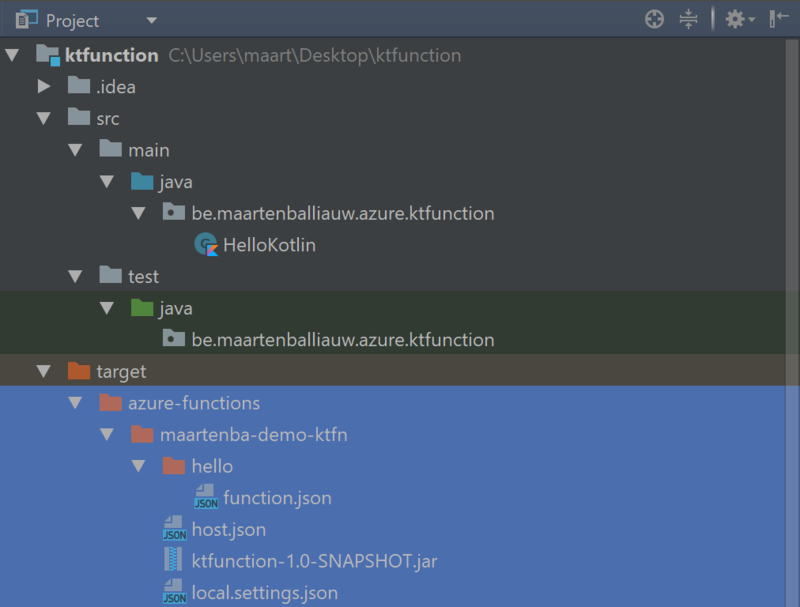 For package, I’ll go with be.maartenballiauw.azure.ktfunction and the appName will be whatever our target function app is called in the Azure portal. 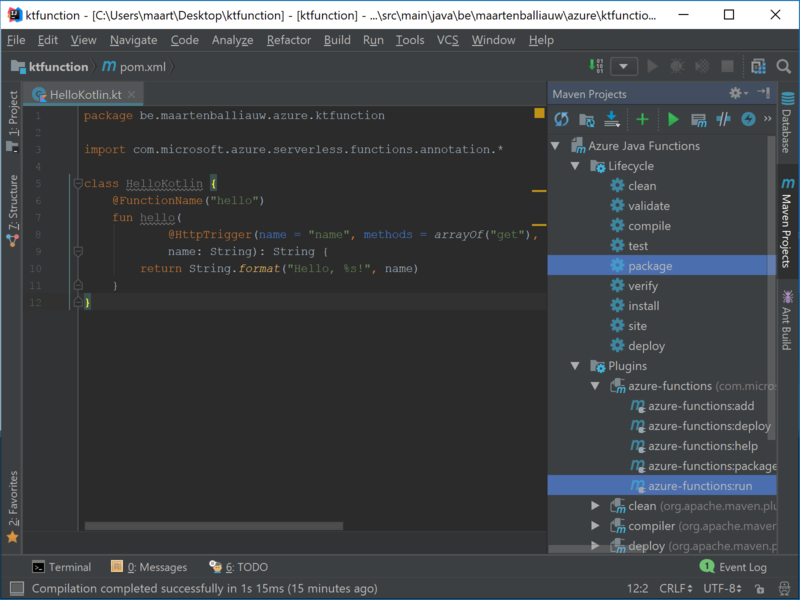 In the next step, we can choose where on disk we want to save our project, then Finish and let IntelliJ IDEA create the new Azure Functions project for us. 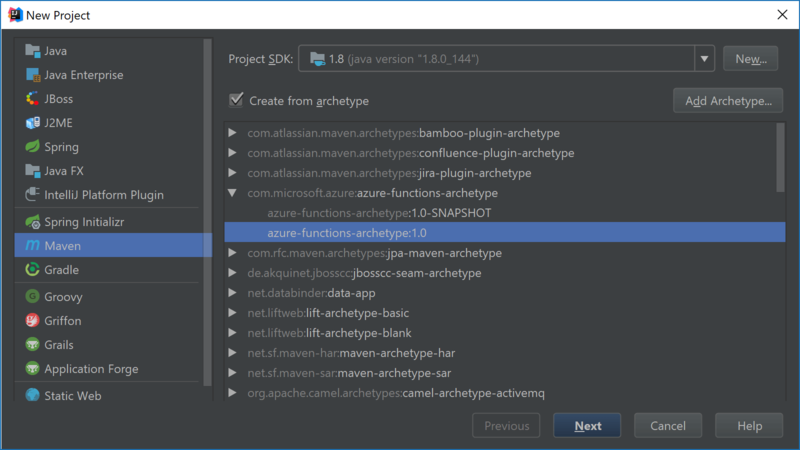 One more thing: Since we’ll use Maven as the project system, IntelliJ IDEA will ask us to manually import the Maven project or auto-import it. Let’s Enable Auto-Import here. Note: If you prefer command-line for the above steps, check the Azure Functions with Maven tutorial Microsoft created. We now have an Azure Functions project that uses Java. Let’s enable Kotlin! This requires either a few manual steps fiddling in our Maven pom.xml file, or a few clicks in the IDE. Let’s go for the latter and use the Tools | Kotlin | Configure Kotlin in Project… menu. A dialog will ask us to specify which modules we want to enable it in, let’s just keep the defaults and make it happen. We’re now ready to write some Kotlin! Open both classes in the editor, press Ctrl+Shift+Alt+K to let IntelliJ IDEA convert these classes to Kotlin. Remove both classes and create our own from scratch. This function is public, takes a non-nullable string (Kotlin dislikes null. If you do want to support null, you could make it a String?). One more thing to do: Add an import statement (the Java and Kotlin equivalent of .NET using), and some annotations (the Java and Kotlin equivalent of .NET attributes) that will help us generate the required Azure Functions metadata to make our project run. This is not required, but it makes life easier. Adding @FunctionName("hello") on the function level will tell the Azure Functions Maven plugin this method will be exposed as a function. AuthorizationLevel.ANONYMOUS) to the name parameter will help the Azure Functions Maven plugin to determine that this parameter is really called “name” and can be available on anonymous GET requests. If we’d run the package target, we will find a ktfunction-1.0-SNAPSHOT.jar file of roughly 5 KB in our project folder on disk (under the target folder if you are curious). This contains our compiled Kotlin Azure Function, but it will not run. Not in the emulator. Not in the cloud. We are missing one thing: our dependencies. When packaging our application, all we get is a package containing our own code, because the project system assumes dependencies can be found at runtime. That’s not true, unfortunately. The Azure Functions cloud environment will not know about Kotlin. If you’re using a database access library or a JSON serializer, the Azure Functions cloud environment will probably not know about it either. In short: We have to include all of our runtime dependencies in our package. To add runtime dependencies to our deployment package, we can edit the pom.xml file. This is the project model Maven uses to do its thing. For .NET developers, it’s a bit of a .csproj mixed with a bit of NuGet and some additional MSBuild. Under the <plugins> element, we can add the following two plugins. Note these should be the first elements under the <plugins> element, at least before the Azure Functions plugins that are in our pom.xml. What does this do? Glad to hear you care! The maven-jar-plugin plugin builds a package based on what the maven-assembly-plugin provides us. The maven-assembly-plugin plugin builds the necessary files to be able to create a self-contained package containing all of our runtime dependencies. Note the appendAssemblyId element has to be set to false, so that the resulting JAR file name is correct for the Azure Functions tools to pick up! Ready? We can now double-click the package Maven goal to generate our deployment artifacts. If you see any failures, execute the clean Maven goal first — it could be that there are some leftover files lingering from before we enabled Kotlin in our project. We can see a .jar file that contains our function code and dependencies. The size is now close to 1 MB (because of the dependencies being embedded). The function.json file(s) have been generated based on the annotations we added earlier in code. Before running, make sure to edit the local.settings.json and add the required Azure Storage settings. We’re there. All set. Ready to roll! We can double-click the azure-functions \| azure-functions:run Maven goal and run our function in the emulator. Note: I have been struggling with an Object reference not set to an instance of an object error at startup. Some back-and-forth e-mails with the Azure team learned this error typically means the JAVA_HOME environment variable is not set. If you encounter this error, make sure to set it! Check the prerequisites again! The result value will be Hello, Maarten! or whatever we wrote in our Kotlin Azure Function. Running our Kotlin Azure Function is one thing, but we may also want to debug it. This is a little bit tricky because of how the Azure Functions runtime works. Our IDE will start #1, while we really want to debug #3. Good thing for us is that the JVM process running our Kotlin Azure Function also exposes itself for debuggers to attach to it! If we now place a breakpoint in our function and invoke our function, the debugger will pause our function and show us what is going on, allowing us to inspect variables, step through code, etc. Running Kotlin in Azure Functions is quite easy. 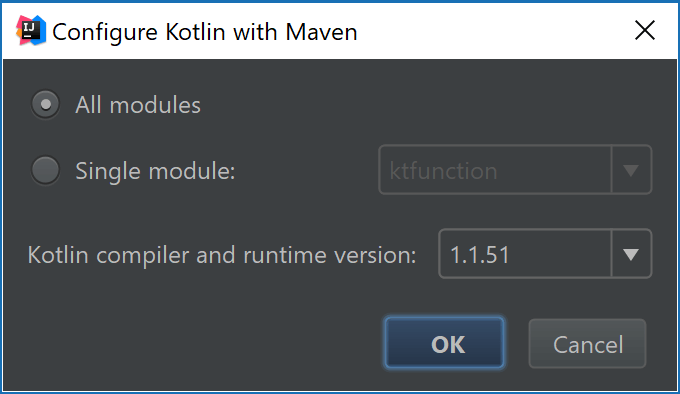 There’s a bit of setup work to make the packaging work properly (but in reality, that happens a lot with any Maven-based project), but apart from that, we can run Kotlin on Azure Functions — both the emulator as well as production. Looking for the sample project? Here you go: ktfunction.zip contains the full project I’ve used throughout this post. Let me know if you try this. I would love to see some Kotlin Azure Functions in production!